Your brakes help keep you and everybody else on the road safe. For this reason, it is essential to keep them maintained and in working order. The technicians at Master Muffler in Orem are knowledgeable about all brake-related issues, and can help you ensure that your brake system is keeping you safe on the road. Your brake system is able to slow down such a heavy object like your vehicle by turning the car’s kinetic energy into friction, which enables it to use its own weight and power to slow down. 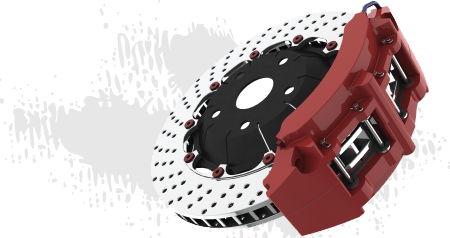 This is done with one of two main types of brake systems: drum brakes and disc brakes. Disc brakes use brake pads that compress into each other when you press on the brakes, which enables you to start and stop, smoothly. Drum brakes use a wheel cylinder that is inside of a drum that is equipped with brake shoes on each wheel. The shoes are pressed against the drum to slow down whenever you use the brakes. 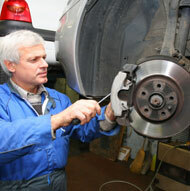 Grinding Sounds: Unusual sounds when you brake are signs that the brake pads are worn away. Pedal Vibrations: When your pedal or steering wheel shakes when you stop, it’s a sign that your brakes may need to be aligned or are starting to become loose. Burning Smells: Burning smells can be many things in a vehicle, but are commonly signs that your brakes are overheating or the pads are wearing away. Pressure Loss in Pedal: If your pedal doesn’t have enough resistance, it may mean that something is wrong with the master cylinder in your brakes. Brake Light Indicator: Some vehicles have a brake light indicator in the dashboard that will tell you when something is wrong with the brake system. Brakes are one of the most important safety features on your vehicle and they are in constant use. Utah has extreme seasonal changes, so it is imperative to make sure your brakes are always in great shape. If you aren't sure how to check your brakes, then bring them into us for a full inspection. Whether your brakes are making sounds or you're just trying to get ready for the coming seasons: We'll make sure your taken care of. Hours: M-F: 8 a.m. - 5:30 p.m. Sat: 8 a.m. - 5:00 p.m.